A sprawling western that suffers from a lot of meaningless meandering, ill-advised side-trips and a severe lack of focus, Major Dundee was one of the films that Sam Peckinpah likely had to make before he could create The Wild Bunch in 1969. 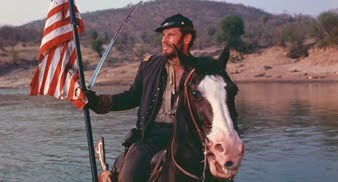 Stories abound of Peckinpah being frequently drunk and incoherent on the set of Major Dundee, with star Charlton Heston having to step into the director's chair to keep the production on track. The resulting mess included a legendary, never-seen version of the movie that extended for 4 hours and 30 minutes. The released version is just over two hours, although it sometimes feels like four hours. Major Dundee is a work of fiction, but very loosely inspired by some real-life skirmishes where Confederate prisoners joined Union soldiers in Texas to battle Indians. In the movie, as the American Civil War draws to a close, a group of Apaches under the leadership of Chief Charriba mount a series of raids and massacres against both Union and Confederate troops in and around New Mexico. The Union's Major Dundee (Heston) has accumulated a patchy war leadership record, and is assigned the somewhat demeaning command of a jail near the Mexico border. He takes it upon himself to assemble a rag-tag force of prison guards (including black soldiers) and prisoners, including his bitter Confederate rival Captain Tyreen (Richard Harris), to go after Chief Charriba and his men. Rather than focusing on their mission, Dundee's soldiers spend a lot of time threatening to kill each other as tensions between North and South, black and white, and jailer and jailed simmer and sometimes boil over. With Dundee mounting an unconvincing pursuit, the Apaches soon take refuge in Mexico, where the French Army has assembled troops, setting up a triangular climactic conflict between Dundee's men, the Apaches and the French. While there is enough going among all the galloping horses to maintain a rudimentary level of viewer attentiveness, the characters in Major Dundee are neither interesting nor sympathetic enough to ignite the movie. The conflict between Dundee and Tyreen, which should have given the film its centre of gravity, is drawn in crayons. Charlton Heston gives Dundee the same over-the-top higher calling that powers his biblical roles, while Harris looks like he just stepped out of a movie about those magnificent men in their flying machines. James Coburn wanders in and out of the movie in an under-used role as Sam Potts, a one-armed half-breed who helps Dundee track the Apaches. Santa Berger all of a sudden shows up in the unlikely role of a stunningly gorgeous European woman stranded in a tiny Mexican village. She further clogs up the progress of the movie by batting her eyelashes and contriving a romance with Dundee that mostly serves to prove her poor judgement and the ease with which he gets distracted. The action scenes are a mixture of the sloppy, the bloody, and the confusing, with Peckinpah clearly still looking, and not yet finding, the artistry that he would bring to The Wild Bunch. Major Dundee is interesting in the same way that a car crash cannot help but draw some attention, but ultimately, its best to move along rather quickly.